Bradley Development’s new apartment complex Rock Pointe located in Rock Hill, SC is now ready for you to move in to these stunning new units. Rock Pointe is an affordable living community just a few minutes down the road from the high prices of Charlotte. Rock Pointe in Rock Hill, SC features a playground, business center, clubhouse, playground & picnic area, high-speed Internet and onsite laundry. It sits near Rock Hill shopping, restaurants and entertainment. Rock Pointe apartments have 2 and 3 bedroom floor plans with 2 baths. Rent falls between $540 and $670. Total floor area for these Rock Hill apartments is between 1115 and 1315 square feet. Affordable housing has become a buzzword in today’s real estate market. It’s no wonder. Families all across the U.S. deserve clean, efficient & affordable housing in safe environments. Whether just starting out, or downsizing, multi-family housing has become the answer for many Americans seeking more reasonable accommodations. But what about today’s college students? 2011 continues to be a solid year for growth in multifamily housing. Bradley Developers is happy to announce that construction is complete on two properties: Bay Pointe (Phase II) in Myrtle Beach, SC, and Rock Pointe in Rock Hill, SC. Bradley Development is going strong in 2011, bringing affordable housing to hundreds of families across the Southeast. Teaming up with Progress Builders, we have found particular success in our local market. 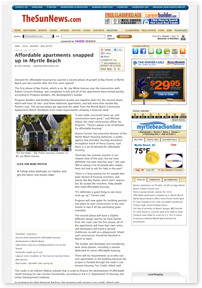 As evidenced in this recent article in The Sun News, the need for affordable housing on the Grand Strand continues to persist. The success of the first phase of the Bay Pointe development led us to begin construction on a second phase. Bradley Developers has hit the ground running in 2011. A leading multifamily housing developer in the Southeastern U.S., we are excited about the growth in our industry. Occupancy rates continued to rise through the end of 2010, and are predicted to continue climbing. While we have several communities in various stages of construction, several are now open & accepting tenants. 2010 has been a big year for Bradley Development. We’ve built several beautiful multifamily communities in the Carolinas, bringing affordable housing to hundreds of families. These developments are not only good for the communities, they’re great investments. It’s no secret that multifamily housing developments are gaining popularity. The recent housing market crash has played a big role in changing our perspective on what kinds of homes people need (and can afford). The role these kind of communities play is changing with the home building & buying trends. Let’s explore some facts/myths about low income housing. Continuing a trend of progress & growth throughout 2010, Bradley Development announces two more affordable housing projects. Following the success of Bay Pointe Phase I, Phase II will break ground in December. This community is designed for new families, students & young professionals. It features 56 units ~ 28 two bedroom/two bath units and 28 three bedroom/two bath units. Like Phase I, this community will feature a clubhouse & playground. In Rock Hill, SC, we’re developing the Rock Pointe community. 48 units: 24 two bedroom/two bath units, 24 three bedroom/two bath units will be available to families in Spring 2011. Demand for affordable housing has spurred a second phase of growth at Bay Pointe in Myrtle Beach just two months after the first units opened.